At NewGround, we look at a company holistically, taking brand, culture, and place into consideration to build the perfect headquarters space. We know that a headquarter is a reflection of your entire brand and is meant to last for a long period of time. The key difference between a nicely designed building and a great one is planning. We work from start to finish to ensure that this process runs smoothly from design all the way to delivery. 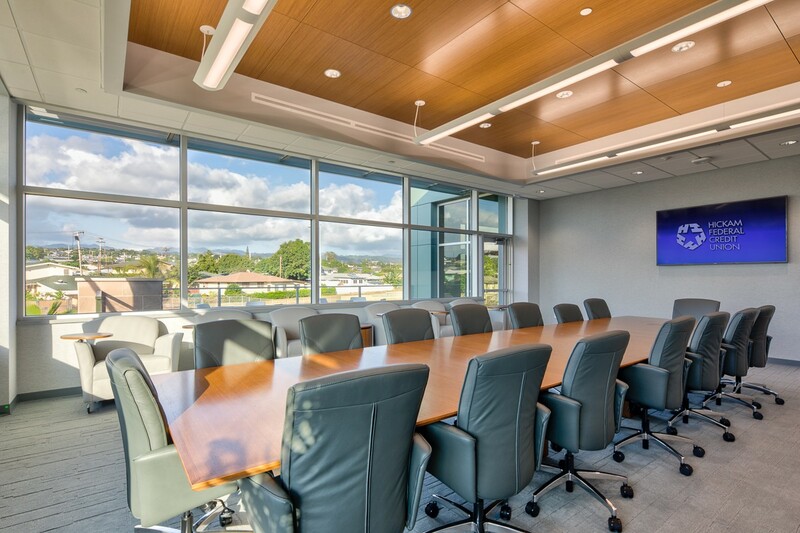 Below are a few of our headquarters projects that had many conversations and planning from the time the contract was signed, all the way to when the design was finished and beyond. Denton Area Teachers Credit Union, known as DATCU, was established in 1936 by 13 professors with just $650.00. However, with growth to over 86,000 members and $800 million in assets, DATCU knew it was time to expand, choosing NewGround to help do just that. Due to the overwhelming growth, DATCU was forced to split its team into multiple buildings which had negative outcomes like logistical problems and the decrease of employee well-being. There were two options: remain in their downtown location or build fresh somewhere else. Due to their future plans, market research, and financial planning, DATCU came to the conclusion to start from scratch and build a large headquarters somewhere else. That somewhere was Corinth, Texas. 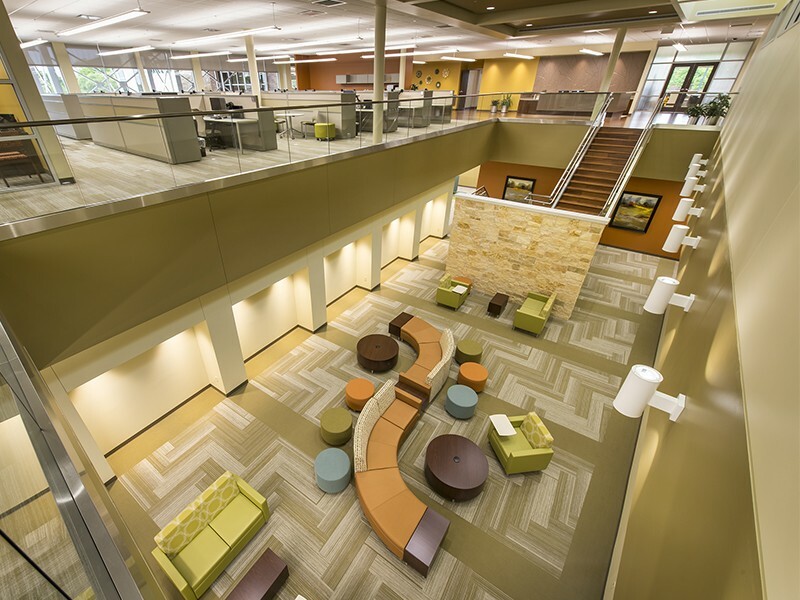 This space ended up being two levels, allowing employees to have space while still working together. There was also a large collaborative zone for brainstorming sessions, meetings, and conversations, located in the middle of the building. 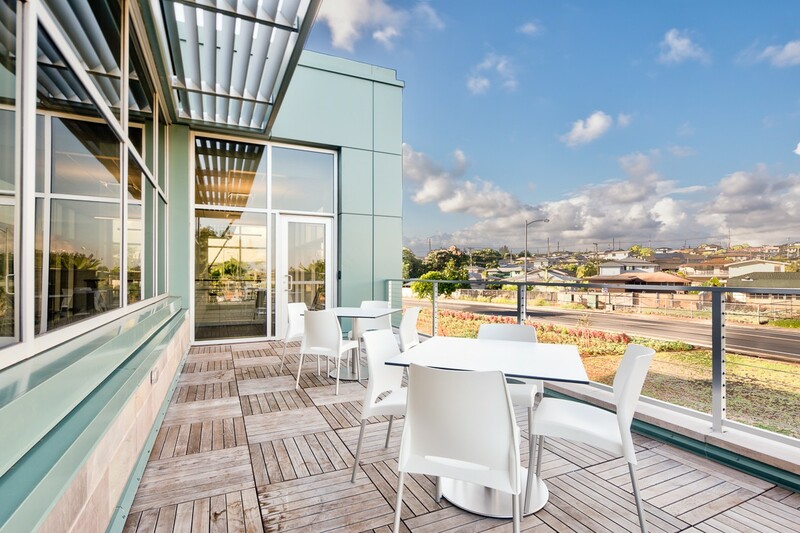 With employee well-being and effectiveness in mind, we also created multiple outdoor terraces to enjoy sunshine and fresh air. Hickam FCU is the longest-serving financial institution on the Hickam Airforce Base, now known as Joint Base Pearl Harbor Hickam. They began to face one major problem; they had run out of space at their corporate headquarters. Due to limited space and security measures, expanding the current location was not an option. In order to move off-base, Hickam FCU needed a partner, that’s where NewGround came in. TTCU, located in Tulsa Oklahoma, had a large problem that was ultimately affecting the overall business and experience for both members and employees. They had employees spread across town in various buildings, offices, and even basements. They knew they needed to realign their business and its employees intoa single structure, driven by efficient design. 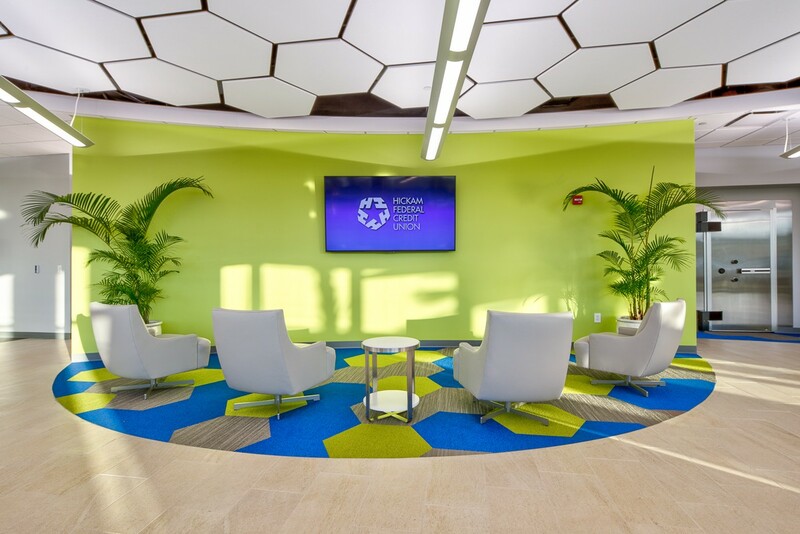 The end goal was to create a space that fostered communication and encompassed a strong community work environment. The employees were the main reason for these key changes. We gave multiple surveys, met with all employees who had a leadership role, and had a two-day Discovery session to find out what they really wanted and needed. 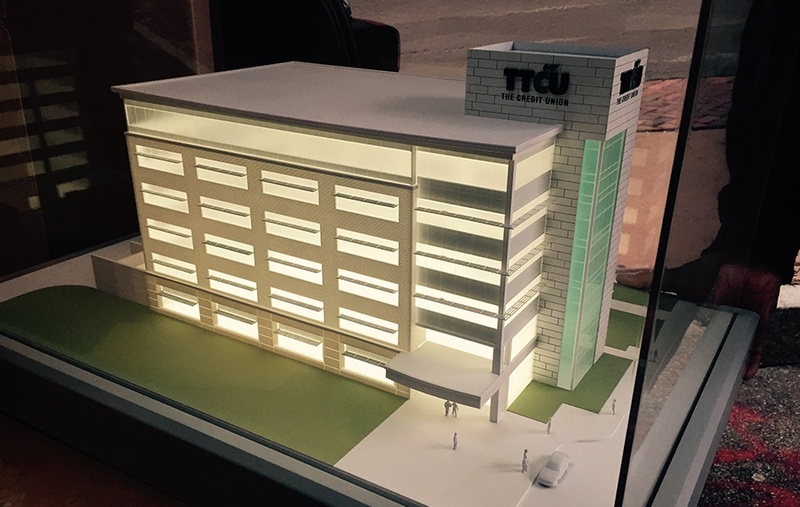 From there, NewGround created an Idea Book—to make everything TTCU wanted—come to life. A towering staircase was the perfect centerpiece. 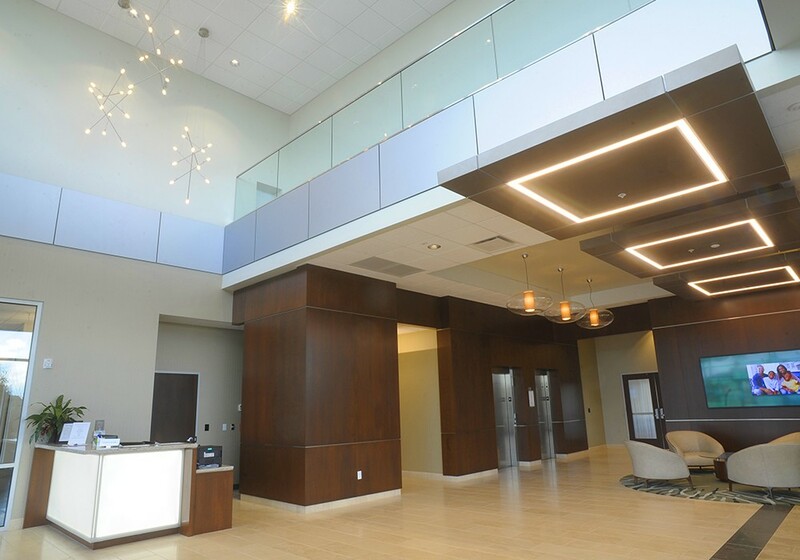 Located next to the elevator and surrounded by large windows to bring in natural light, this staircase was a great way for employees to bump into each other throughout the day. A large IT room, which kept all servers and six data center racks, was also a huge development for the space. 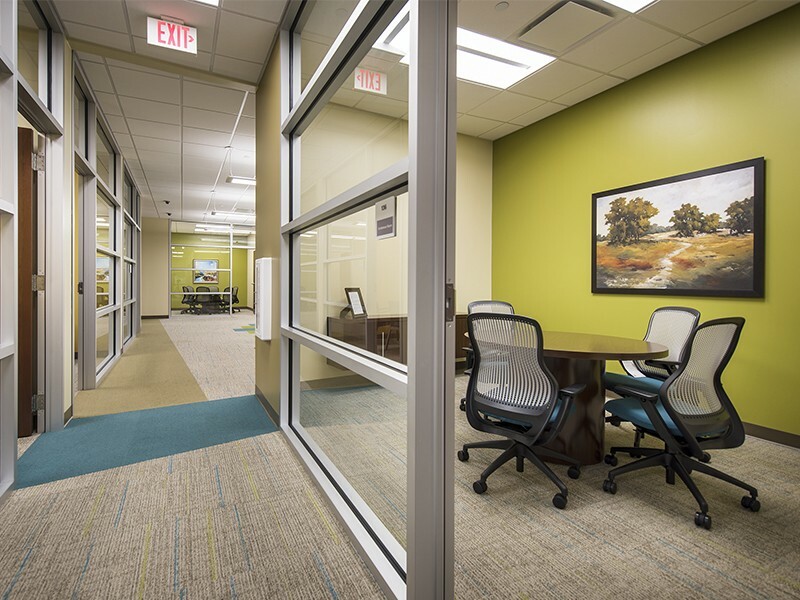 With it being located in Tornado Alley, we provided additional protection with concrete block walls on the first floor to ensure the safety of employees and members. The two most luxurious features we created for employees were the large gym and cafeteria which encompassed large windows like the rest of the space and provided healthy and social options for employees.